Fun. Bright. Funky. These words are not typically used to describe a hotel, but The Maxwell Hotel in Seattle, WA is all of these things and more. A member of the Stay Pineapple brand, the hotel embraces a much different approach to city dwelling. Nestled not far from the city’s major attractions, the hotel welcomes guests in a quiet neighborhood with colorful accommodations and several benefits that makes you feel like you are staying with friends not at some corporate hotel. 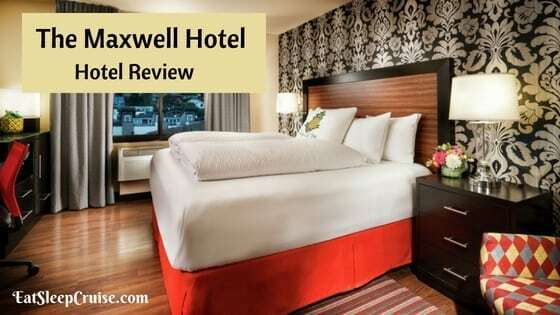 Before our recent cruise on Norwegian Bliss, we spent a pre-cruise stay at the Maxwell Hotel that gave us just the rest and relaxation we needed for our upcoming voyage. 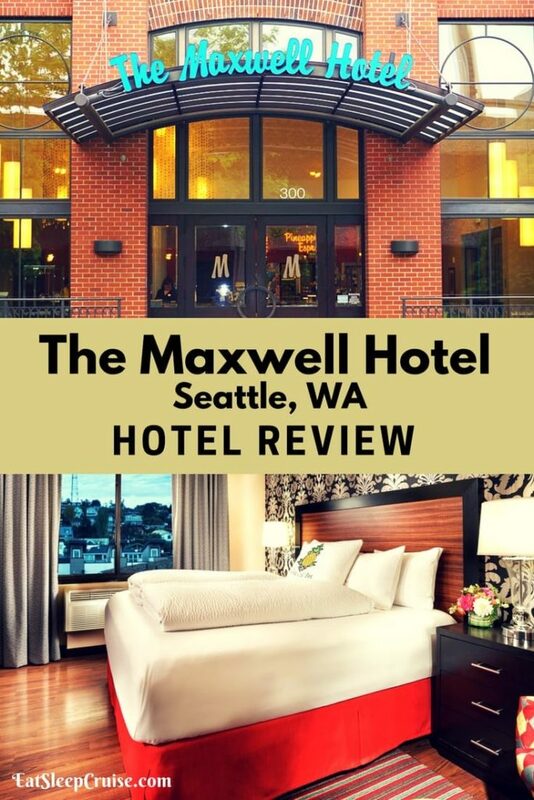 Our Maxwell Hotel Seattle Review will show you why this hotel is one of our top picks for hotels in the city. The first thing you notice about this intimate hotel is the open public spaces. While cozy in size, the layout reminds us of an open house. 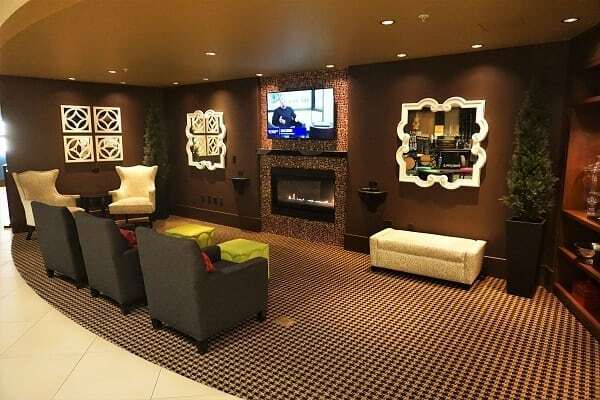 With the circular reception desk to greet you when you arrive to the living room-like seating area with a television and fireplace, this hotel is inviting you to stay for a while. The splash of color and bold design give the hotel a modern and fun aesthetic. This Seattle feel flows throughout the property, which boasts four different room categories and four different styles of suites. During your stay, you can grab a coffee and breakfast at the Espresso Pineapple, catch up on work in the lounge, take a dip in the indoor pool, or workout at the fitness center. Whatever you choose to do, you will certainly feel welcomed. 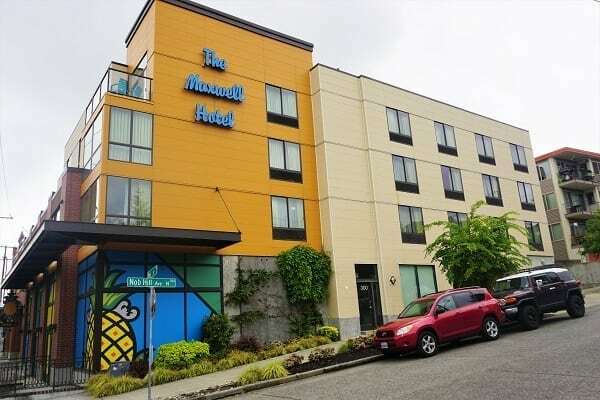 While conveniently located within a mile or so of major attractions like the Space Needle and Pike Place, you are just close enough to all the action; however, the rooms are anything but what you would expect to find in a city hotel. The spacious, over-sized rooms provide ample space for you to spread out. The lighthearted decor continues into the bedrooms as well. The room includes several separate spaces, including a lounge chair next to the bed and a work desk with several outlets and USB plugs. For us over-packers, we appreciated the counter space and extra room for all our belongings. Other feel at home touches include a mini fridge, a microwave with a complimentary bag of popcorn, and a large flat screen television. 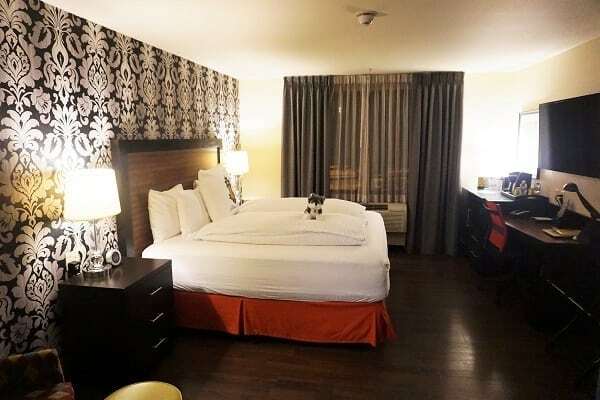 Oh, and let’s not forget Dash, the brand’s signature stuffed pup waiting on the bed to greet you! The “Naked Experience” is billed as some of the most comfortable bedding. And, it did live up to its name. We were asleep in a matter of minutes after our long day of travel. The bathroom too was delightful as it was probably just as big as some of the inside cabins we have stayed in on a cruise ship. With a large walk-in shower and double sinks, the layout was ideal for those traveling as a family or with individuals who take a long time to get ready in the morning (not mentioning any names). Perhaps the best part of the hotel is all the additional extras that come with staying at the Maxwell Hotel. Where some properties will charge you for everything, the Maxwell takes the opposite approach and includes almost everything in your stay. For starters, you have access to unlimited bottles of water and Keurig coffee for your room. After all, sometimes you need a cup just to make it downstairs for your real java. Your stay includes unlimited high-speed WiFi throughout the property. A complimentary shuttle is also available 6 days a week to take you to the city landmarks (Note, you can not use the shuttle for transport to the cruise piers). For more athletic individuals, there are free beach cruisers that you can use to explore this eco-friendly city. When you arrive home in the afternoon, you will even be greeted with some signature pineapple cupcakes. All rooms are equipped with large golf umbrellas for you to bring along during your adventures as you never know when it will rain in Seattle. Bathrobes are another nice touch for some relaxation. Almost everything you could need to make your stay in the city more accessible and carefree is complimentary. What could be better? Granted, we only spent one night at the hotel, but what we were able to experience had us sold. 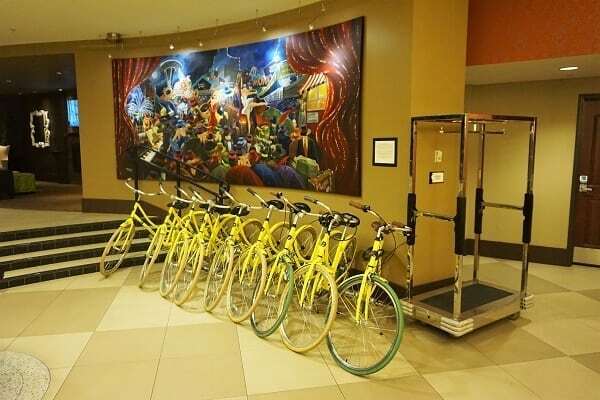 For cruisers looking to spend more time in Seattle, this hotel provides all of the nice little extras, so you can spend your time exploring more of the Emerald City, for a reasonable price. The over-sized king room we occupied for the night had a price tag of $231, when booked 6 months in advance. An additional $20 service fee is applied to all reservations for the use of the public venues and other hotel amenities. Other room categories of various sizes with varying views are also available. We took an Uber from the Seattle-Tacoma International airport (approx $40), but those within driving distance can self-park their cars for a fee of $35 a day. Whether you are driving or making a cross-country flight, you will want to cozy up in one of the Maxwell’s plush beds after a long day of traveling. It will be just what you need to start your Alaskan cruise! 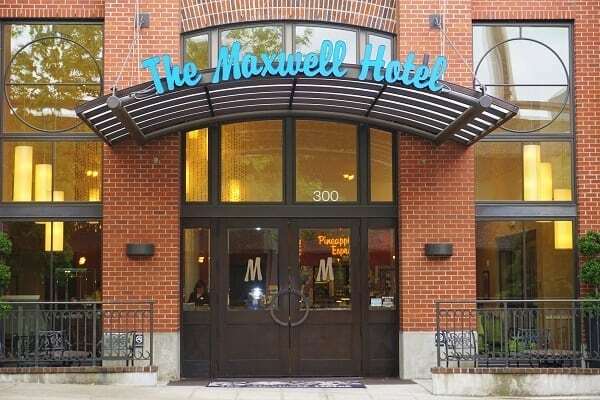 Have you stayed at the Maxwell Hotel in Seattle? What is your favorite place to stay when cruising from this Northwest homeport? Drop us an anchor below to share your Seattle hotel preferences. Disclaimer: We were sponsored guests at the hotel, but all opinions and reviews are 100% our own.